ALPHARETTA, GA – June 27, 2017 – the D Las Vegas (the D), a downtown Las Vegas-based casino hotel boasting unique and high-energy gaming experiences, is enhancing its profitability through the use of The Rainmaker Group’s (Rainmaker’s) guestrev® and revcaster® revenue optimization solutions. the D has gone live with both solutions, which are designed to help them leverage total guest value to maximize profit, as well as to gain deeper insights into competitor pricing through advanced rate shopping. 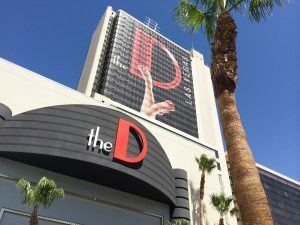 the D is home to a two-level casino, 629 remodeled rooms and LONGBAR, the longest bar in Nevada, as well as various onsite dining and entertainment options, making the need for advanced revenue management data analysis a top priority for the property. Prior to implementing guestrev®, the D was manually monitoring its customer segments to forecast and make pricing decisions. Now the revenue management team is able to focus more time on what matters most to the property, such as optimizing inventory to ensure that rooms are sold at the right price for transient hotel guests and that rooms With guestrev®, the team can more efficiently assess data and esnure that room rates reflect the total profit potential of every guest segment. the D was also using an alternate system for rate shopping before implementing revcaster®, but realized that it needed a more user-friendly system that could fully automate the data collection process and better fit the needs of the property. revcaster® gives the D’s team all the data they need in a clear, actionable format. With minimal effort, revenue managers can determine where their market strength is relative to seasonality, supply and demand, and local competitors at any given time, creating a more accurate, more profitable pricing strategy. Rainmaker will be showcasing its entire Hotel Revenue and Profit Optimization Cloud platform this week during HITEC Toronto at booth #1852. For more information on Rainmaker solutions, please visit: http://www.letitrain.com.